Recently Kevin Morris, who has had a long and distinguished AFL career both on and off-field, joined key PNG football personnel National Operations Manager Peter Cates and AFL QLD Northern Region Development Manager and AFLPNG CEO Andrew Cadzow on the “Saveman” tour of PNG to kickstart their new season. Their tour made it plainly obvious that footy is exploding in the country of six million (with estimates suggesting it will grow to around 14 million by mid-century). 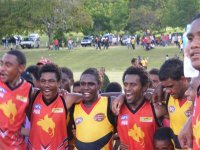 It's an exciting time for the sport in Australia's nearest neighbour, with a new AFL Academy in PNG and the under 14s national side now set to follow the under 16s to the Queensland state championships. The "Saveman" moniker was used as AFL PNG sees its involvement in PNG holistically. With AIDS and HIV a major problem in the nation, the national body see their role as an educational one, not just in terms of playing our game but also in terms of developing a healthy approach to all facets of life. Kevin Morris played football for both Richmond and Collingwood and was a Richmond Premiership player in 1973 and 1974, and also the Richmond B & F winner in 1975. He has an extensive coaching resume including being a Senior Coach in the SANFL at West Adelaide and an Assistant Coach in the AFL for Essendon, Richmond and St Kilda. At present he is the Australian Institute of Sport (AIS) AFL Coach which led to his involvement in this trip where his knowledge of systems, pathways and talent identification would be particularly useful. Cadzow said of Kevin's involvement "His input over the 8 days was of the highest standard. He got involved in all aspects and was a real boost for both the locals and the Australian Volunteers. His input to the training, media and general image building was first rate". The tour commenced with a launch at the Australian High Commission in Port Moresby where a grant was presented from the Australian Sports Outreach Programme (ASOP) by the High Commissioner to purchase footies. 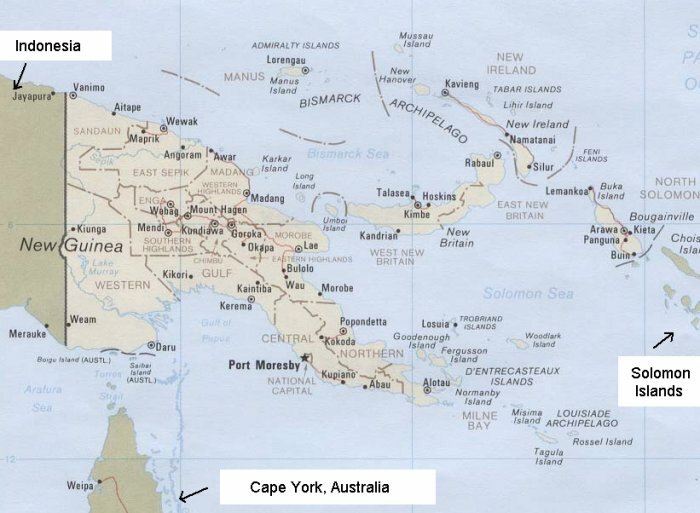 After this Kevin and Andrew went through the Highlands and Lae whilst Peter went to the Buka in Bougainville and then on to Hoskins & Kimbe in West New Britain. Peter Cates said that "The reception and enthusiasm I received was outstanding and Kevin and Cadz received the same sort of enthusiastic reception wherever they went". Training sessions for hundreds of young kids and information seminars for the teachers and volunteers were held, and interschool competitions have commenced in all the areas. Since his return to Port Moresby Cates said that "I have been inundated with phone calls from other areas wanting to commence AFL Programs". Given that in the various areas there are already 160 teams which are either boys, girls or mixed, playing with numbers of between 12-18 per team from Under 12 to Under 17 it gives some idea of the potential for growth in the country. This number of junior teams does not include the 52 already discussed in a previous article on Port Moresby. It also does not include the Buka area that had not yet commenced their season, the new centres in Kundiawara and Goroka that will soon commence and further areas Rabual, Kandrin, Kerimu and Pomio that are being set up at present. The framework for quality careers in AFL are already being established, with the U16 Binatangs (Little Beetles) having played in the QLD U16 State Championships in May and the U14 Binatangs to play in their first QLD State Championships in July. Various players from the U16 squad have had the chance to stay on and play in the QAFL and at lower League level and also for a couple of the boys to be involved in the U16 State Squad trainings. Supporting this development is the establishment of the AFL Academy of Sport. AFLPNG has formed an Affiliation with De La Salle Secondary School and formalized an Academy of Sport for AFL. Thirty boys from the school have been selected to take part in the programme and these include two boys relocated from Kimbe and Kerema as part of an AFLPNG Scholarship Scheme. The long term aim is to have talented players identified from all over PNG and relocated to De La Salle as part of the Talented Player Program. The number of relocated players is only restricted by current funding levels. The program includes weekly skill lessons by AFLPNG Staff, fortnightly weight and gym sessions at Taurama Leisure Centre and in school lessons on nutrition, time management and goal setting. With the programmes, structure and key personnel implemented in PNG it appears that football development will move considerably quicker forwards now than in the initial stages of building, or in the case of PNG, rebuilding the sport. Perhaps the final words on this major achievement should go to National Operations Manager Peter Cates "I am convinced that the only thing standing in the way of AFL being the dominant junior sport in PNG is resources, fiscal and physical". For more on PNG view the updated website at www.afl-png.com.